On Sunday July 14th over 100 staff and students from all seven MC College Group schools across Western Canada attended the eighth annual MC Viva Las Vegas conference. 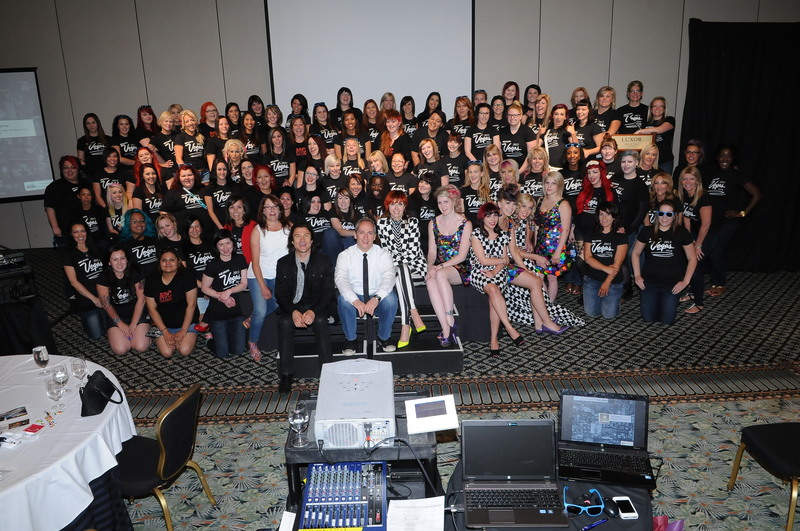 Every student who enrolled in the Hairstyling program in June received this free trip to Las Vegas to participate in the conference and attend the North American Hairstyling Awards. The conference, just for MC students and staff, featured renowned European stylist and Pivot Point International Artistic Director Yolly Ten Koppel along with International platform artist Laddie James. Yolly and Laddie presented models showing the latest in coloring, cutting and styling techniques. As if that wasn’t exciting enough, MC students and staff were treated to a special guest presentation by acclaimed competition artist, Charlie Price. Charlie has been nominated for countless North American Hairstyling Awards and Canadian Mirror Awards. He spoke about his love of hairstyling and high-fashion and how he combined them both by working backstage as a hairstylist at fashion shows in New York and Europe. He also discussed his previous NAHA entries and winners. Day one was filled with more outstanding guest speakers from Robert Passage, Chairman and CEO and Melanie Koroyan-Kopeikin, President, both of Pivot Point International and a surprise visit from Carrie and Erin of The Hair Nerds! Later that evening, students and staff attended the 24th North American Hairstyling Awards Gala hosted by Mario Lopez. Students saw the amazing work of the hairstyling industry’s elite including Dimitrios Tsioumas. On the final day of the conference, students were introduced to Laura Dunphy, Publisher of industry magazine, Salon Magazine. Laura spoke about the Contessas (a Canadian hairstyling awards) as well as her impressive career. We also met Shaun Pulfrey, the creator of Tangle Teezer. He spoke about how he created the styling tool, his Dragon’s Den experience and gave a demo on how to use the Tangle Teezer! To bring our exciting day two to a close, Jeff Louis, National Artistic Director of Artego Canada, created a fun questionnaire and promoted interaction between students and staff. One of the best answers to the question “Whose hair would you like to do, past or present?” – Jesus. The objective of the trip is to create an exciting impression of the industry for new students. MC College Group believes in training their students to succeed. The best way to teach success is by observing successful people. What better exposure can there be, than meeting with and listening to industry icons! For more information about this exciting career, go to www.mccollege.ca. To see more photos, check out our Facebook page!